Communism's collapse both prompted and was accelerated by the long-anticipated reunification of Germany. What were the political and social undercurrents that led to the abrupt collapse of East Germany? What problems have arisen since reunification? Clearly, communism has left a cultural and political void that begs to be assessed. Laurence McFalls here offers a full understanding of communism's collapse, providing an explanation for the cultural conflicts and the identity crisis that have afflicted Germany since reunification. 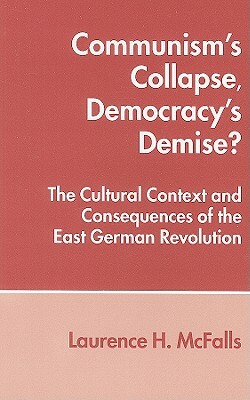 Testing the validity of the common theories of Eastern European collapse, the work criticizes these systemic explanations of East Germany's demise for failing to take into account the motivations of ordinary citizens who, McFalls asserts, ultimately toppled the regime. To answer the question who overthrew Honecker?, McFalls has interviewed over 200 East Germans, identifying the primary players who brought about the East German revolution of 1989. In his in-depth examination of the artificial German state, McFalls exposes the historical, economic, social, and political legacy of communism. challenging and provocative, Communism's Collapse, Democracy's Demise? will be of interest to a broad scope of scholars of sociology, historians, political philosophers, and political scientiests.